Racing into Marathon Monday, your training is on point, your sleep is on point, and your nutrition is on point…but what about your hydration? Do you have a plan for how many water cups you’ll grab along the racecourse? Have you stashed enough salt tabs and sports drinks to keep your electrolytes in check? We don’t mean to send you into hysteria at your lack of preparedness, but hydration is one of the most variable and critical components of performing at your best—just ask medical tent coordinator Chris Troyanos, who says dehydration is hands down the most common issue he deals with on race day. Getting your fluid needs just right is a tall task, based on activity level, sweat rate, and your environment. No longer is it safe to recommend the standard eight cups. But how do we know we’re getting the appropriate amount of water? Meridith Unger, CEO of Nix, wanted to answer this question, and she did so in the form of a new wearable technology. Nix, a Boston-based company out of the Harvard Innovation Launch Lab, is a single-use biosensor patch with a digital interface that adheres to the skin and is worn on your hand or arm. It monitors your sweat rate and hydration status, providing actionable information in real-time. Based on biomarkers in your sweat, it is able to tell you whether or not to reach for water, Gatorade, or nothing at all while you’re out on the course. Unger describes it as a functional band aid. “It’s like an insurance policy on your hydration for the day,” she says. Having been an athlete all her life, Unger has always struggled with her hydration. As a college basketball player, she never knew how much to drink, and now, as a marathoner, she has suffered from hyponatremia during a race. “It’s scary because the symptoms are much like dehydration,” she says. “I wanted to create a product that helps notify people before they get in critical condition.” Before founding Nix, she helped launch six life science startups with several venture capital and venture creation firms and saw a need for something like this in the market. Sara Weber, marketing director at Nix, says they’re measuring in the mild dehydration range, where your performance and cognition will be impaired, but at a point when you’re able to take care of it before issues of passing out, or worse, occur. According to multiple studies, marathoners cross the finish line mildly dehydrated 80 percent of the time, and mild dehydration can lead to a 29 percent decrease in performance. Unger says that’s the difference between her breaking four hours in the marathon and coming in at four hours and 40 minutes. The company says multiple athletes during the 2018 marathon will be using Nix—marking the first time any participant has worn a biosensor of this kind. 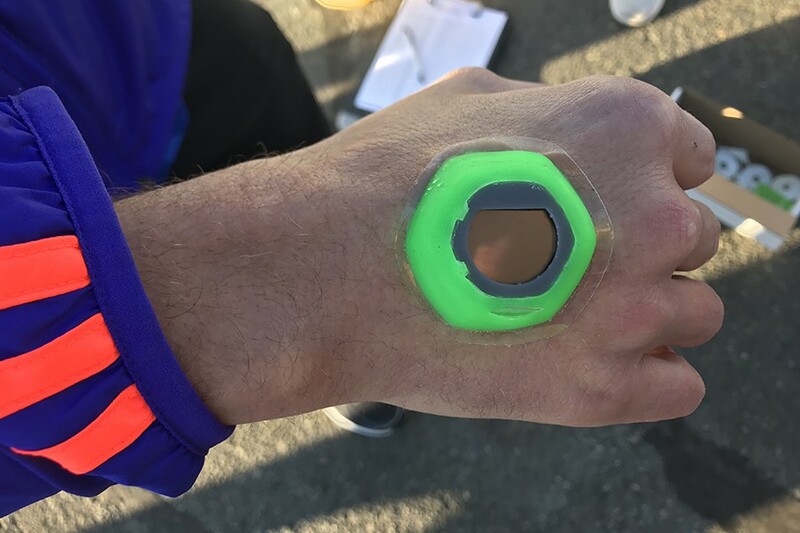 Ranging from amateurs to local celebrities, those who will be wearing the sensor include race director Dave McGillivray and marathoner Becca Pizzi. Conceptually, Nix has been in the works since 2014, and has been more practically in the hands of users in the last two years for beta-testing. Right now, only people who sign up on their website can be chosen to test the product. Unger hopes to start launching the product commercially online by next year. “I hope to get to the point where racers just grab a pack of Nix while they’re grabbing their bars and GU’s for race day,” she says. She says they are still in the stages of collecting data from everyone who tries it and that being able to collect data from athletes wearing it during the marathon will be fundamental. Race day is sacred for an athlete, so to be welcomed into that is huge, she says.